The Book Rat: Breadcrumbs excerpt and art! 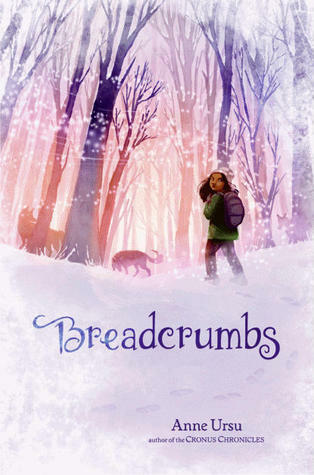 I've mentioned before how excited I am for the book Breadcrumbs, which retells one of my favorite fairy tales, Hans Christian Anderson's The Snow Queen. 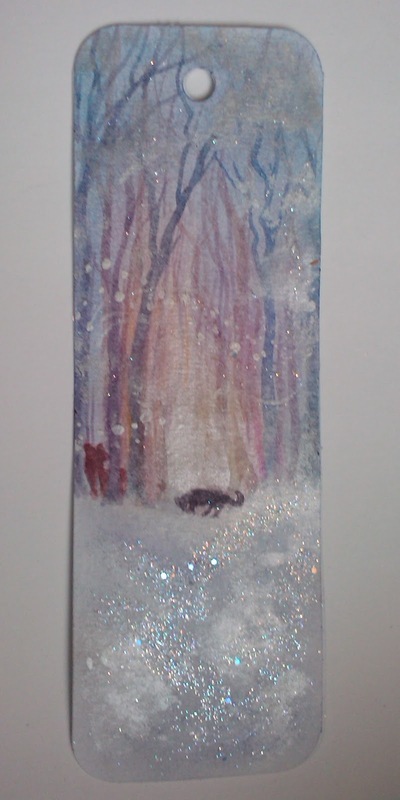 I even made a bookmark based on the cover for a swap on Goodreads! So I was super excited when Walden Pond Press sent me a copy to review for you (soon! ), and I am pleased as punch to share with you an excerpt and a sneak peek at the unbelievably gorgeous artwork! The snowflakes landed on him like a blessing. Like they saw him and welcomed him. He could see them, too, every perfect symmetrical bit of them. They were icy assurances, proof that there was an order to things. You could crawl into the center of one and understand everything. A gust of wind picked up in the woods, and the snow in front of it began to stir. It was like a small tornado had settled at the tree line, and snow began to whirl around faster and faster. Jack took a step back as the spinning column got bigger, and part of him wanted to run, but it was only a small part. For he understood he was seeing magic. And indeed he was. 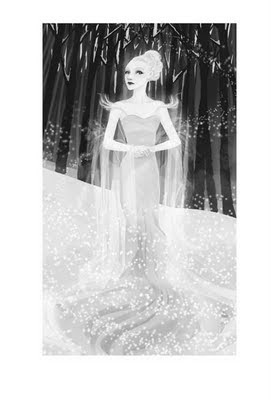 For the snow was not snow anymore, but a woman—tall and lithe like a sketch, in a white fur cape and a white shimmering gown that looked so thin it would melt if you touched it. Hair like spun crystal framed cream-colored skin. The woman stepped closer, revealing eyes as bright as the sun reflecting off snow. But they were cold things, and it was like looking for solace in frost. Jack could not move as she walked toward him. It did not seem possible that she would be coming for him, but she was. Her eyes did not leave him, and in her cold gaze he found his breath again. The air welcomed him back. “Are you real?” he asked, though it was a stupid thing to ask. “I am,” she said, her voice twinkling and melodic. “How do you do that?” He motioned to the snow out of which she had come. She was in front of him now, and Jack felt his chest expand and then freeze, an inhalation with no companion. “No. I want to know. I want to understand things. I want to understand everything.” He sounded so desperate to his own ears. “I see. And what will you do when you understand everything? Will you share your knowledge to better the world?” Her eyes sparkled with mischief. I need to read this book this month! Haven't had time yet, and it calls to me!